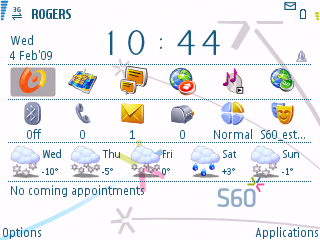 Do you ever get tired of the way your E71 homescreen looks? Maybe you want MORE from the homescreen to make your powerful device even more efficient? Thanks to the open programming capabilities of S60 and the creativity of developers these wants and needs are possible with Handy Shell. Handy Shell completely overhauls the standard S60 homescreen. It allows you to see see the amount of your missed calls, emails, and messages. Weather notifications are shown, along with bluetooth status and 8 more shortcuts. Not to mention the clock is displayed much bigger. As you can see it looks like a completely different device. Click here to read the full review by Series60.com and click here to buy the product. Click here to trial Handy Shell.